as Londinium, c. 43 C.E. London, situated in south-eastern England at the head of the River Thames estuary, is the largest urban area and capital of England and the United Kingdom. An important settlement for two millennia, London's history goes back to its founding by the Romans. Since its settlement, London has been part of many important movements and phenomena throughout history, such as the English Renaissance, the Industrial Revolution, and the Gothic Revival. The city's core, the ancient City of London, still retains its limited medieval boundaries; but since at least the nineteenth century, the name "London" has also referred to the whole metropolis which has developed around it. London is one of the world's leading business, financial, and cultural centers, and its influence in politics, education, entertainment, media, fashion, and the arts all contribute to its status as a major global city. Its diverse population draws from a wide range of peoples, cultures, and religions, and over 300 languages are spoken within the city. The city is home to a plethora of nationalities that have over time molded and shaped the city's culture into what it is today. While London can claim to be a major influence in many areas, it is weak in religious practice. It is lower than any other part of the United Kingdom or Western Europe and is approximately seven times lower than American averages. The city boasts four World Heritage Sites: The Palace of Westminster, Westminster Abbey and St. Margaret's Church; the Tower of London; the historic settlement of Greenwich; and the Royal Botanic Gardens, Kew. The city is one of the most popular tourist destinations in the world, and its popularity has increased over the years due to economic growth. The term “City of London,” or “the City,” applies to a small area known as the Square Mile (2.59 square kilometers) that was the original settlement (ancient Londinium) and is now part of the financial and business district of the metropolis. Greater London covers an area of 609 square miles (1579 square kilometers), making it the 37th largest urban area in the world. 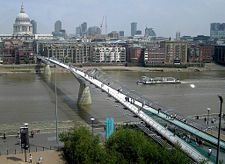 The Millennium Bridge, infamously known as the "Wobbly Bridge." London lies within the bowl of the London Basin, 50 miles (80km) upriver from its mouth at the Nore, where the English Channel joins the North Sea. The center of the basin is dominated by the modern valley of the Thames, which forms a level corridor running from west to east. The modern floodplain is around half a mile wide to the west of Greater London, expanding to two miles wide to the east. This is bordered by slightly higher and older terraces often extending several miles from the floodplain, for example in Hounslow and Southwark. London has a temperate marine climate, like much of the British Isles, with regular but generally light precipitation throughout the year—unlike the rest of the United Kingdom and even the nearby coast. The warmest month is July, with an average temperature range of 56.5 to 73.0 °F (13.6 °C to 22.8 °C). The Thames, a navigable river flowing west to east across the London Basin, is tidal, rendering London vulnerable to flooding. Larger left bank tributaries include the Colne, Crane, Brent, Lea or Lee, Roding, Rom and Ingrebourne. Significant right bank tributaries include the Mole, Wandle, Ravensbourne, and the Darent and its tributary the Cray. A number of canals or canalized rivers have been constructed in the London area, mostly in the late eighteenth and early nineteenth centuries, originally for goods traffic. London began on the Thames' north bank and for many centuries London Bridge was the only bridge, keeping most of the city on the north bank. When additional bridges were built in the 18th century, the city expanded in all directions. The City of London is on the site where the Roman fort of Londinium, founded in the first century C.E., stood. St. Paul’s Cathedral stands on the western edge of the City, while the Tower of London, the repository of the Crown Jewels, lies to the south-east. West of Tower Bridge is London Bridge. To the east and northeast of the City are the working-class districts of the East End. London's new financial and commercial hub is the Docklands area to the east of the City, on the north bank of the Thames, dominated by the Canary Wharf complex. West of the City lie the Inns of Court, the legal district, and Fleet Street, once the home of Britain’s press. Other businesses located in the City of Westminster, the home of the UK's national government and the well-known Westminster Abbey. The West End contains most of the best-known theaters and shopping districts. West London is also known for fashionable and expensive residential areas such as Notting Hill, Knightsbridge, and Chelsea. 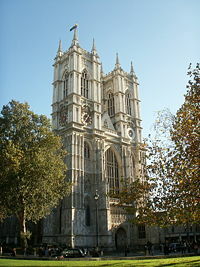 Westminster Abbey is one of London's oldest and most important buildings. During prehistoric times, London was most likely a rural area with scattered settlement. Londinium was established as a civilian town by the Romans about seven years after the Roman invasion of Britain in 43 C.E. In around 60 C.E., it was sacked by the Iceni, led by their queen Boudica, but rebuilt as a planned Roman town. During the second century, Londinium reached its height and replaced Colchester as the capital of Roman Britain (Britannia). Its population was around 60,000 inhabitants. It boasted major public buildings, including the largest basilica north of the Alps, a governor's palace, temples, bath houses, amphitheatre and a large fort for the city garrison. In 410 C.E., the Roman occupation of Britain came to an end. 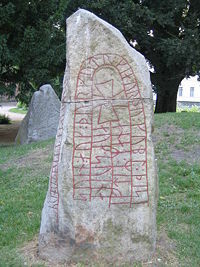 From the sixth century, Anglo-Saxons began to inhabit the area. By the 600s, the Anglo-Saxons had created a new settlement called Lundenwic approximately 1000 yards (1km) upstream from the old Roman city, around what is now Covent Garden. London revived, and by the eighth century, trade was prospering again across the English Channel and the North Sea. A Viking raid in 851 destroyed that city. A Viking occupation 20 years later was short-lived. Alfred the Great, the new King of England, established peace and moved the settlement within the defensive walls of the old Roman city (then called Lundenburgh). The original Saxon city of Lundenwic became Ealdwic ("old city"), a name surviving to the present day as Aldwych, which is in the modern City of Westminster. Subsequently, under the control of various English kings, London once again prospered as an international trading center and political arena. Viking raids began again in the late tenth century, and reached a head in 1013, when they besieged the city under Danish King Canute and forced English King Ethelred the Unready to flee. In a retaliatory attack, Ethelred's army achieved victory by pulling down London Bridge with the Danish garrison on top, and English control was re-established. Following a victory at the Battle of Hastings, William the Conqueror, the then Duke of Normandy, was crowned King of England in the newly-finished Westminster Abbey on Christmas Day 1066. William granted the citizens of London special privileges, while building a castle in the southeast corner of the city to keep them under control. This castle was expanded by later kings and is now known as the Tower of London, serving first as a royal residence and later as a prison. London grew in wealth and population during the Middle Ages. In 1100, its population was around 18,000, by 1300, it had grown to nearly 100,000. However disaster struck during the Black Death in the mid-fourteenth century, when London lost nearly a third of its population. Apart from the invasion of London during the Peasants' Revolt in 1381, London remained relatively untouched by the various civil wars during the Middle Ages. The Tudor period, from 1485 until 1603, was a dramatic period of English history, when Henry VII, Henry VIII, and Elizabeth I transformed England from a comparatively weak European backwater into a powerful state. The Reformation produced little bloodshed in London. Before the Reformation, more than half of the area of London was occupied by monasteries, nunneries and other religious houses, and about a third of the inhabitants were monks, nuns and friars. Thus, Henry VIII’s “Dissolution of the Monasteries” meant nearly all of this property changed hands. The Crown redistributed Catholic Church property into the hands of royal supporters, who sold them, turned them into spectacular dwellings, or redeveloped them for industrial and commercial purposes. During this period, trade expanded to Russia, the Levant, and the Americas. London boomed from a population of about 50,000 in 1500 to perhaps 140,000 in 1600, and to about 750,000 by 1700. The "Great Plague" occurred in 1665 and 1666, and killed around 60,000 people, which was one fifth of the population. The Great Fire of London broke out in the original City and quickly swept through London's wooden buildings, destroying about 60 percent of the City, including Old St Paul's Cathedral, 87 parish churches, 44 livery company halls, and the Royal Exchange. Only 16 died. Rebuilding took over 10 years largely under direction of a Commission appointed by King Charles II and chaired by Sir Christopher Wren, and followed the street plan of the old city. Many aristocratic residents never returned, preferring to take new houses in the West End, where fashionable new districts such as St. James's were built close to the main royal residence, which was Whitehall Palace until it was destroyed by fire in the 1690s, and thereafter St. James's Palace. The Revocation of the Edict of Nantes in 1685, led to a large migration on Huguenots to London. At this time the City of London was becoming the world's leading financial center, superseding Amsterdam. In 1700, London handled 80 percent of England's imports, 69 percent of its exports and 86 percent of its re-exports. The eighteenth century was a period of rapid growth for London. New districts, such as Mayfair, were built for the rich in the West End, new bridges over the Thames encouraged an acceleration of development in South London and in the East End, the Port of London expanded downstream from the City. During this period was also the uprising of the American colonies. Eighteenth century London was dogged by crime, and the Bow Street Runners were established in 1750, as a professional police force. Penalties for crime were harsh, with the death penalty being applied for fairly minor infractions. Public hangings were common in London, and were popular public events. London as engraved by J.&C. Walker in 1845 from a map by R. Creighton. Many districts in the West End were fully developed, and the East End also extended well beyond the eastern fringe of the City of London. There were now several bridges over the Thames, allowing the rapid development of South London. The Houses of Parliament from old Westminster Bridge in the early 1890s. 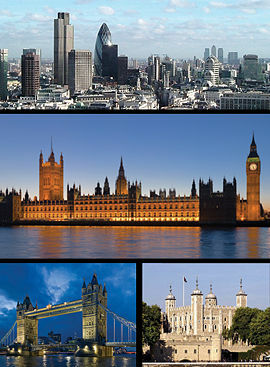 During the nineteenth century, London was transformed into the world's largest city and capital of the British Empire. Its population expanded from one million in 1800 to 6.7 million a century later. While the city grew wealthy as Britain's holdings expanded, nineteenth century London was also a city of poverty, where millions lived in overcrowded and unsanitary slums. Life for the poor was immortalized by Charles Dickens in such novels as Oliver Twist. In 1829, the prime minister Robert Peel established the Metropolitan Police as a police force covering the entire urban area. The force gained the nickname of "bobbies" or "peelers," named after Robert Peel. Nineteenth century London was transformed by the coming of the railways. A new network of metropolitan railways allowed for the development of suburbs in neighboring counties, from which middle-class and wealthy people could commute to the city's center. As the capital of a massive empire, London became a magnet for immigrants from the colonies and poorer parts of Europe. A large Irish population settled there, with many of the newcomers refugees from the Great Famine (1845-1849). London also became home to a sizable Jewish community, and small communities of Chinese and South Asians settled in the city. The first railway to be built in London was a line from London Bridge to Greenwich, which opened in 1836. This was soon followed by the opening of great rail termini, which linked London to every corner of Britain. One of the most famous events of nineteenth century London was the Great Exhibition of 1851. Held at The Crystal Palace, the fair attracted visitors from across the world and displayed Britain at the height of its Imperial dominance. London's population continued to grow rapidly in the early decades of the twentieth century, and public transport was greatly expanded. A large tram network was constructed by the London County Council, through the LCC Tramways. And the first motorbus service began in the 1900s. Improvements to London's overground and underground rail network, including large scale electrification were progressively carried out. During World War I, London experienced its first bombing raids carried out by German zeppelin airships; these killed around 700 people and caused great terror, but were merely a foretaste of what was to come. The largest explosion in London occurred during World War I: The Silvertown explosion, when a munitions factory containing 50 tons of TNT exploded, killing 73 and injuring 400. A London street hit during the Blitz of World War II. London suffered severe unemployment during the Great Depression of the 1930s. In the East End during that same decade, politically extreme parties of both the right and left flourished. 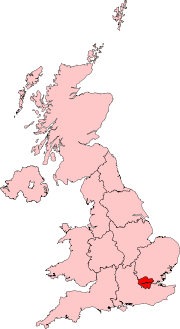 The Communist Party of Great Britain won a seat in the House of Commons, and the far-right British Union of Fascists received extensive support. Clashes between right and left culminated in the Battle of Cable Street in 1936. The population of London reached an all time peak of 8.6 million in 1939. Large numbers of Jewish immigrants fleeing from Nazi Germany, settled in London during the 1930s, mostly in the city's West End. During World War II, London was bombed extensively by the Luftwaffe as a part of The Blitz. Hundreds of thousands of children were evacuated to the countryside to avoid the bombing. Civilians took shelter from the air raids in underground stations. 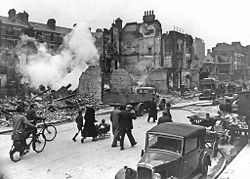 Between September 1940, and May 10, 1941, London was subjected to 71 separate raids receiving over 18,000 tonnes of high explosive. Towards the end of the war, during 1944 and 1945, London came under heavy attack again by pilot-less V-1 and V-2 rockets, fired from Nazi occupied Europe. By the war's end, just under 30,000 Londoners had been killed by the bombing, and over 50,000 seriously injured, tens of thousands of buildings were destroyed, and hundreds of thousands of people were made homeless. London's rebuilding was slow to begin. In the immediate postwar years housing was a major issue, due to the large amount of housing destroyed in the war. The authorities decided upon high-rise blocks of flats (apartments). During the 1950s and 1960s, the skyline of London altered dramatically as tower blocks were erected, although these later proved unpopular. Large-scale immigration from Commonwealth countries and beyond transformed London into one of the most racially and culturally diverse cities in Europe. Integration of the new immigrants was not always smooth, with major race riots in Notting Hill and Brixton, but was certainly smoother than in other English regions and largely lacking in widespread support for far right organizations. An economic revival from the 1980s onward re-established London's position. However, it has been subjected to bouts of terrorism. Provisional Irish Republican Army bombers sought to pressure the government into negotiations over Northern Ireland. More recently, a series of coordinated bomb attacks were carried out by Islamic extremist suicide bombers on the public transportation network on July 7, 2005, just 24 hours after London was awarded the 2012 Summer Olympics. 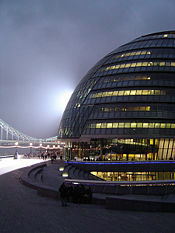 City Hall at night, headquarters of the Greater London Authority. London is the home of the Government of the United Kingdom which is located around the Houses of Parliament in Westminster. Many government departments are located close to Parliament, particularly along Whitehall, including the Prime Minister's residence at 10 Downing Street. London is represented in the national Parliament by 74 Members of Parliament (MPs) who correspond to local parliamentary constituencies. The City has its own governance and boundaries, giving it a status as the only completely autonomous local authority in London. The administration of London takes place in two tiers—a city-wide, strategic tier and a local tier. City-wide administration is coordinated by the Greater London Authority, while local administration is carried out by 33 smaller authorities. The Greater London Authority consists of two elected parts; the Mayor of London, who has executive powers, and the London Assembly, who scrutinizes the mayor's decisions and can accept or reject his budget proposals each year. The Greater London Authority was set up in 2000 to replace the similar Greater London Council which had been abolished in 1986. The 33 local authorities are the councils of the 32 London boroughs and the City of London Corporation. They are responsible for local services not overseen by the Greater London Authority, such as local planning, schools, social services, local roads and refuse collection. London is one of the largest centers for finance in the world, and has the sixth largest city economy in the world after Tokyo, New York, Los Angeles, Chicago, and Paris. London generates approximately 20 percent of the UK's GDP (or $446 billion in 2005); while the economy of the London metropolitan area (the largest in Europe) generates approximately 30 percent of the UK's GDP (or an estimated $669-billion in 2005.) Per capita GDP was US$72,500 that year. 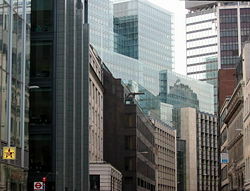 Financial and business services sector accounts for about 85 per cent of London’s employment. London’s banking sector accounts for about 20 per cent of total international bank lending. London has one of the largest international insurance markets, the world’s largest center for trading overseas equities, the largest foreign exchange market, one of the biggest financial derivatives markets, the greatest concentration of international bond dealers, and major markets for transactions in commodities. 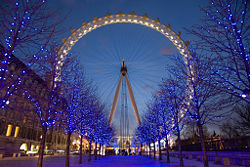 London also has a vast range of legal, accountancy, management, property, computer, and advertising consultancy services. A second, smaller financial district is developing at Canary Wharf, to the east of the City, which includes the global headquarters of HSBC, Reuters, Barclays, and the Magic Circle, which includes Clifford Chance, the largest law firm in the world. Tourism employed the equivalent of 350,000 full-time workers in London in 2003. Annual expenditure by tourists is around £15-billion, and overseas visitors accounted for 70 percent of this spending. London has about 480 hotels. The most popular attractions are the British Museum (five million visitors in 2001), the National Gallery, Westminster Abbey (where the sovereign is crowned), Madame Tussaud’s waxworks, the London Eye (a giant Ferris wheel near Westminster Bridge), and the Tower of London. Another half a million employees resident in Greater London work in manufacturing and construction, almost equally divided between both. Heavy industry has declined since World War II, and between 1982 and 1994, the numbers employed in manufacturing almost halved to approximately 328,000. Printing and publishing accounts for over a quarter of London’s manufacturing employment, reflecting London’s role as an administrative, financial, and media center. Other sectors include electrical and electronic engineering; food, drink, and tobacco; and chemicals and synthetic fibers. There is strong growth in the recycling/environmental sector. The centerpiece of the public transport network is the London Underground—commonly referred to as The Tube—which has 11 interconnecting lines. It is the oldest, longest, and most expansive metro system in the world, dating from 1863. The Docklands Light Railway is a second metro system, which opened in 1987, serving East London and Greenwich on both sides of the Thames. High-speed Eurostar trains link St. Pancras International with Lille and Paris in France, and Brussels in Belgium. London's bus network runs 24 hours, with 8000 buses, 700 bus routes, and over six million passenger journeys made every weekday. Travel in outer London is automobile-dominated. The inner ring road (around the city center), the North and South Circular roads (in the suburbs), and the outer orbital motorway (the M25, outside the built-up area) encircle the city and are intersected by a number of busy radial routes—but very few motorways penetrate into inner London. In 2003, a congestion charge of £8 per day was introduced to reduce traffic volumes in the city center. London is a major international air transport hub. Eight airports use the words "London Airport" in their name, but most traffic passes through one of five major airports. London Heathrow Airport is the busiest airport in the world for international traffic, and is the major hub of the nation's flag carrier, British Airways. The Port of London is now only the third-largest in the United Kingdom, handling 50 million tonnes of cargo each year. The London Underground is the oldest (1863), longest, and most expansive metro system in the world. Heathrow Airport is the world's busiest airport in terms of numbers of international passengers. 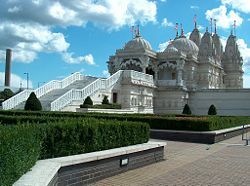 The Swaminarayan Hindu Temple in Neasden. The City and the 32 boroughs had an estimated 7,517,700 inhabitants as of mid-2005, making London the second most populous city in Europe behind Moscow (10,415,400 inhabitants) and the most populous in the European Union. London's continuous urban area extends beyond the borders of Greater London and was home to 8,278,251 people in 2001, while its wider metropolitan area has a population of between 12 and 14 million depending on the definition of that area. The population density is 12,331 people per square mile (4,761/km²), more than 10 times that of any other British region. In terms of population, London is the 25th largest city and the 17th largest metropolitan region in the world. London was the most populated city in the world until overtaken by New York in 1925. Its population peaked at 8,615,245 in 1939. According to 2005 estimates, 69.6 percent of London's population is classed as white, including White British (58.2 percent), White Irish (2.6 percent), and "Other White" (8.8 percent), the majority of whom are other Europeans. 12.9 percent of people are of South Asian descent, including Indian, Pakistani, Bangladeshi, and "Other Asian" (mostly Sri Lankan, Arab and other Southern Asian ethnicities). A total 10.8 percent of people are Black (around 5.5 percent are Black African, 4.4 percent as Black Caribbean, 0.8 percent as "other Black"). A total 3.4 percent are of mixed race, 1.4 percent are Chinese, and 1.9 percent of people belong to another ethnic group (mostly Latin American. While English is the official language, a survey of London's ethnic and religious diversity in 2005 claimed that there were more than 300 languages spoken and more than 50 non-indigenous communities which have a population of more than 10,000 in London. The 2001 census showed that 27.1 percent of Greater London's population were born outside the UK, and a slightly higher proportion were classed as non-white. As of 2008, 40 percent of London's total population was from an ethnic minority group. Across London, Black and Asian children outnumber White British children by about six to four. The largest religious groupings in London are Christian (57.8 percent), No Religion (15.5 percent), Muslim (7.9 percent), Hindu (4.1 percent), Jewish (3.1 percent), and Sikh (1.5 percent). London has traditionally been dominated by Christianity, and has a large number of churches, particularly in the City. The well-known St Paul's Cathedral in the City and Southwark Cathedral south of the river are Anglican administrative centres, while the principle bishop of the Church of England and worldwide Anglican Communion, the Archbishop of Canterbury has his main residence at Lambeth Palace in the London Borough of Lambeth. Religious practice is lower than any other part of the UK or Western Europe and is around seven times lower than American averages. Despite the prevalence of Anglican churches, observance is very low within the Anglican denomination, although church attendance, particularly at evangelical Anglican churches in London, has started to increase. Home to a range of universities, colleges, and schools, London has a student population of about 378,000, and is a center of research and development. Most primary and secondary schools in London follow the same system as the rest of England. With 125,000 students, the University of London is the largest contact teaching university in the United Kingdom and in Europe. It comprises 20 colleges as well as several smaller institutes, each with a high degree of autonomy. King's and Royal Holloway and more specialized institutions, such as the London School of Economics, SOAS, the Royal Academy of Music and the Institute of Education. Senate House, the headquarters of the federal University of London. 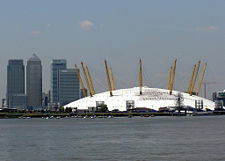 The O2, one of the largest dome structures in the world, originally built to celebrate the new millennium, is now a part of a huge redevelopment project and hosts many major events. London is too diverse to be characterized by any particular architectural style. It is, however, mainly brick built, most commonly the yellow London stock brick or a warm orange-red variety, often decorated with carvings and white plaster mouldings. Some areas of the city, particularly those just west of the center, are characterized by white stucco or whitewashed buildings. 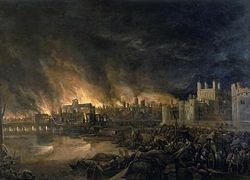 Few structures predate the Great Fire of 1666, except for a few trace Roman remains, the Tower of London, and a few scattered Tudor survivors in the City. A majority of buildings in London date from the Edwardian or Victorian periods. 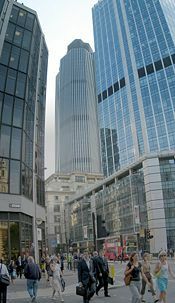 London's skyscrapers such as the notable "Gherkin," Tower 42, and One Canada Square are usually found in the two financial districts, the City of London and Canary Wharf. The Monument in the City of London provides views of the surrounding area while commemorating the Great Fire of London, which originated nearby. Marble Arch and Wellington Arch, at the north and south ends of Park Lane respectively, have royal connections, as do the Albert Memorial and Royal Albert Hall in Kensington. Nelson's Column is a nationally-recognized monument in Trafalgar Square, one of the focal points of the center. Often called "The Green City," London has a number of open spaces. The largest of these in the central area are the Royal Parks of Hyde Park and its neighbor Kensington Gardens at the western edge of central London and Regent's Park on the northern edge. A number of large parks lie outside the city center, including the remaining Royal Parks of Greenwich Park to the southeast, Bushy Park and Richmond Park to the southwest, and Victoria Park, East London to the east. Primrose Hill to the north of Regent's Park is a popular spot to view the city skyline. Some more informal, semi-natural open spaces also exist, including the Hampstead Heath of North London. The British Museum has collections ranging from Egyptian and Classical antiquities through Saxon treasures to more recent artifacts. The Victoria and Albert Museum have examples of porcelain, glass, sculpture, fabrics and costume, furniture, and musical instruments, all set in a building of Victorian grandeur. Nearby are the Museum of Natural History and the Science Museum. The Museum of London has exhibits dealing with the development of the capital from its origins to the present day. Sunset over the River Thames towards Tower Bridge. The Theatre Museum displays the history of the performing arts. There is the Imperial War Museum, the National Army Museum, the Royal Air Force Museum, the National Maritime Museum, the Wallace Collection (of paintings, furniture, arms and armor, and objects d’art), Sir John Soane’s Museum, and London’s Transport Museum. Art galleries include the National Gallery, the National Portrait Gallery, which has more than 9000 portraits, the Tate Britain, which houses the largest collection of British paintings from the 16th century to the present day. 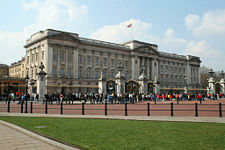 The Queen’s Gallery in Buckingham Palace exhibits pictures from the royal collection. The British Library, the national library of Britain, has a collection of more than 150 million separate items. Publishers are required to deposit in the Library a copy of everything they publish. London has about 100 theaters, including the three auditoriums of the Royal National Theatre, the two auditoriums at the City’s Barbican Centre, and the Royal Court Theatre. The largest concentration of commercial theaters is in the West End. In 1989, the remains of the Globe Theatre, where Shakespeare acted, and the Rose Theatre, where his plays were performed during his lifetime, were excavated in central London. A reconstruction of the Globe Theatre, near its original site, was unveiled in 1996. Concert halls include the Royal Festival Hall, the Barbican Hall, the Royal Albert Hall, the Wigmore Hall, and St John’s Church in Smith Square, Westminster. Symphony orchestras include the London Symphony, the London Philharmonic, the Royal Philharmonic, the Philharmonia, and the BBC Symphony. There are also several London chamber orchestras and choirs. The Royal Opera and the Royal Ballet perform at the Royal Opera House, Covent Garden. Canary Wharf skyscrapers, situated in the isle of Dogs, East London. ↑ Office for National Statistics, Population Estimates for UK, England and Wales, Scotland and Northern Ireland Retrieved March 10, 2018. Ackroyd, Peter. London: The Biography. New York: Nan A. Talese, 2000. ISBN 978-0385497701. Inwood, Stephen. A History of London. New York: Carroll & Graf Publishers, 1998. ISBN 978-0786706136. Reddaway, T.F. The Rebuilding of London After the Great Fire. London: Arnold, 1951. Sheppard, F.H.W. London: A History. Oxford: Oxford University Press, 1998. ISBN 978-0198229223. This page was last modified on 10 March 2018, at 23:28.